What is a hero? That's one of the main questions that writer Ed Brubaker has been asking during his run on Captain America. What characteristics and qualities do you find in your heroes like Captain America, the Falcon or even Iron Man? Ever since Brubaker revealed that Bucky Barnes was still alive and brainwashed into being the Winter Soldier, we've seen Steve Rogers doing everything he could to rescue and redeem his former sidekick, friend and fellow hero. As Steve Rogers struggled to believe in and help Bucky, we've had to ask if redemption and freedom was possible as we've seen the Winter Soldier be used and kill. The Winter Soldier was more weapon than man and he was a weapon in the wrong hands. Bucky, one of the great deaths in comics, was back but Steve Rogers was the only person who believed he could be saved and we watched as Captain America fought to reach out to his friend, his ally and his brother-in-arms. Now Steve Rogers is dead, killed by the Red Skull and Bucky is out for revenge. Without Steve Rogers around to guide him, can Bucky Barnes truly be a hero again? In The Death of Captain America Volume 2: The Burden of Dreams, events begin to come more into focus following the killing of a national hero and icon. The book opens with two of the main characters, Sharon Carter and Bucky, captured by the Red Skull, one brainwashed into serving him and the other being tortured and brainwashed. Even as the Red Skull fights to keep control of his ally General Lukin, no one is in complete control of themselves or their actions but it does look like the Skull has the upper hand. But the Red Skull does not have as strong of a hold over everyone as he likes to think and Bucky soon winds up on a SHIELD helicarrier, under the control of Tony Stark. While it is still part of the same larger story, The Burden of Dreams is a very different book than the The Death of Captain America volume one. Brubaker shakes up his storytelling, abandoning the quick and choppy transitional storytelling of the first volume and spending more time developing his scenes while he concentrates firmly on the growth and development of Bucky, who takes center-stage in this story. The chaos and confusion following the death of Steve Rogers is replaced by planning and action as Tony Stark and Bucky begin filling the void left following Steve Rogers' death. Borrowing a term from another superhero's famous death, what do you do in a world without Captain America? I don't think it's much of a spoiler at this point to say that by the middle of this book, Bucky Barnes is wearing Captian America's uniform and slinging his shield. Does the fact that he's got the look make him Captain America? Does that make him a hero? Brubaker has shown since the beginning of his run on this title that there's more to the hero than the clothes and the shield. It's the man who's wearing those clothes that's important. Steve Rogers wasn't a hero because he was Captain America. He was Captain America because he was a hero first. That's the man he was, sacrificing himself in his last moments to save one of his guards from the assassins bullet. Brubaker has continually shown that Bucky Barnes was a fighter and that he was loyal but his heroism is still questionable. Brubaker doesn't give any easy answers to the questions he raises. His story is a fantastic thriller, equal parts Bourne Identity, All The President's Men and old school Marvel. The best Captain America writers like Steve Englehart, Jack Kirby and Roger Stern have used the character to explore heroism and the American way. 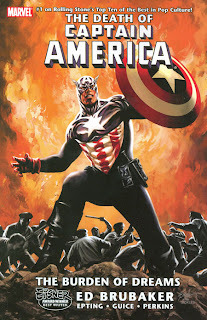 Brubaker continues the heritage of Captain America, questioning the characters role in the twenty-first century. Setting up the Red Skull as the now head of a large mega-conglomerate corporation, Brubaker shows America being attacked on many levels, from within and without. As well as the obvious and overt actions of Sin, the Skulls' daugther, at causing chaos in Washington DC, the Skull's company begins undermining the fabric of America, striking at Wall Street and Main Street through weak financial institutions. On all fronts, America has been beaten and weakened and is in need of a hero. It's in need of Captain America. Bucky may have the costume and the mask but he's still not Captain America in The Burden of Dreams. It takes more than a costume to be a hero just as it takes more than a hero to be an icon. In this book, America is under attack and looking for a hero and that may be Bucky Barnes but he still has the same doubts about himself that others have -- can he fill the void left by Steve Rogers? Can he be a hero like Rogers was, fighting for something larger than himself? Of course, Steve Rogers wasn't the national icon overnight, so how can Tony Stark or the Black Widow expect Bucky Barnes to be?